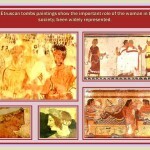 Copper Age | Art History Summary. Periods and movements through time. It was denominated like Copper Ages for a long time to this period that coincides with the Chalcolithic period (also it is known as Eolithic) of the Stone age, was classified before between the Neolithic and the Bronze Age, but according to a more updated classification it is presumed that its beginning was around 6000 BC to 2500 BC. 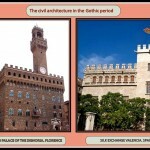 What was before considered as a distinctive separate period; is now been classify as a transition period before the Bronze Age, since few human settlements knew this technique according to the findings, being in many cases that they used copper, because of their trade or exchange with the few cultures of human settlements that indeed knew how to elaborate it, this stages of limited knowledge and use of cooper, usually precede the period in which bronze was used. Copper was one of the first metals that man used, first using it in its natural state because it did not know the mechanisms by which the mineral could be fused. Although not all human settlements, came to use it or even know their use, until they did not meet with more advanced cultures that certainly knew how to obtain this metal. 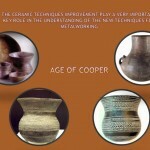 It was not until the techniques of elaboration of the ceramic were perfected much later that it was possible for the man to succeed with the experimentation of the metallurgical processes in the third millennium BC, when adding to cooper other metals obtained new alloys as is the case of arsenic First and the tin after which gave rise to the bronze. The most manufactured objects in the Chalcolithic period were still done in stone, like perforated double-use axle-type tools (ax-pick, hammer or hoe), since copper is not hard enough to use in tools. Copper was therefore used for the elaboration of ornaments, (rings, bracelets and pins) of decorative use, not of utilitarian use, since the artifacts manufactured in stone were much stronger and durable, having a wider scoop of different use. Metallic objects in this period such as the ones elaborated in Byblos, could also include the use of gold and silver. 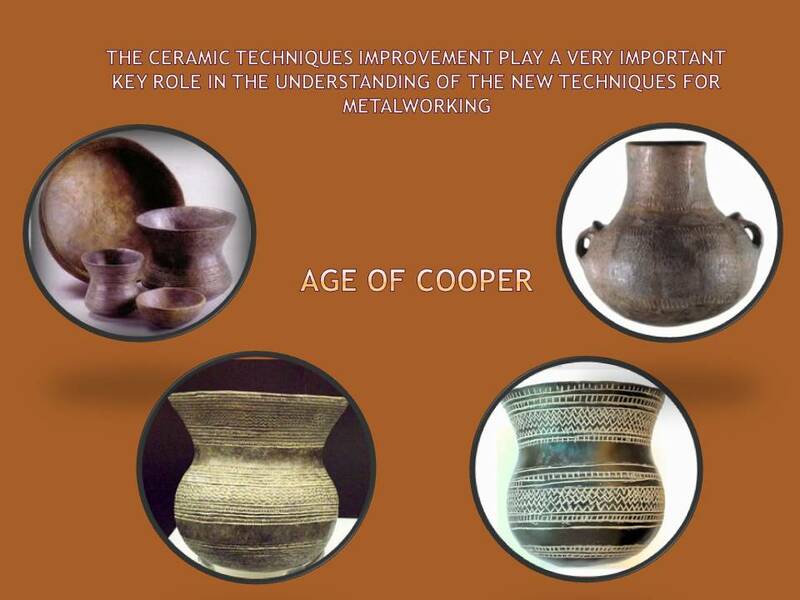 As mentioned; the improvement of ceramic techniques play a key role in the understanding of new techniques for metalworking as well. Those ceramic vases are done in this period with excellent quality, red or wet wood, profusely decorated with horizontal bands (burned) or printed, with geometric, striped, or chess patterns. 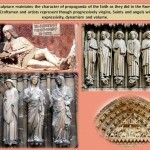 Was a chalky- litho manifestation in the elaboration of ceramic that manifested along European territories and is by its inverted bell-shaped and richly decoration why is called by this name, they have generally been found in funerary contexts. Is a pottery decorated with strings of rope and is associated with the introduction of the metal in the North of Europe. Apart from ceramics, the elements that best defines this archaeological horizon are the funerary tributes that usually consist, almost invariably of a ceramic glass ornaments manufactured in bone, with a characteristic V drilling buttons, pendants of clay in the form of spirals of gold, the abundant of the so-called “Palmela” arrows, triangular daggers in copper and perforated plates (medium grade metamorphic rocks). 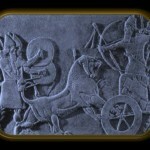 The Age of Bronze – 2500-800 B.C. 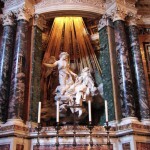 The age of bronze is characterized by important milestones in the history of mankind. At this Age occur a greater spread of agriculture and animal husbandry and the mastering of a new materials – metal: copper and its alloys. At the beginning of metals period occurs a greater contact among peoples living in vast territories. This process of socialization and contact is especially manifest in the Eurasian steppe territories, where the period of paleo metal started the productive economy of cattle breeding. In many aspects it was related to the new technical advances, such as wheeled vehicles still in the period of late bronze – with the use of horses for several tasks. Changes in the technological aspect stand out that improve economical aspects which generated an intensification of trade to and from long distance, a certain specialization labor and social differentiation increased in this period in which is detected a clear proliferation of new trades and some craft specialization. Elaborated objects for personal use or domestic purpose also marked the different social aspect in which the wealthy had access to more elaborate and ornate objects, been those differences extended as well to funeral matter. Also are the quality of weapons they can reach, among general aspects of urban life. Not in all regions was that way; for example in America metallurgy does not seems to have socio-economic implications, was only more in the technical aspect. 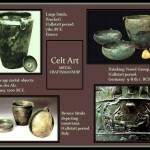 The art of bronze age has some specific characteristics. Becomes more diverse and spreads widely geographically. Paint on smaller objects, sculptures and steles. 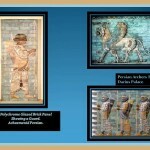 They make frequent use of ornament and artistic images for decoration of tools and household goods. 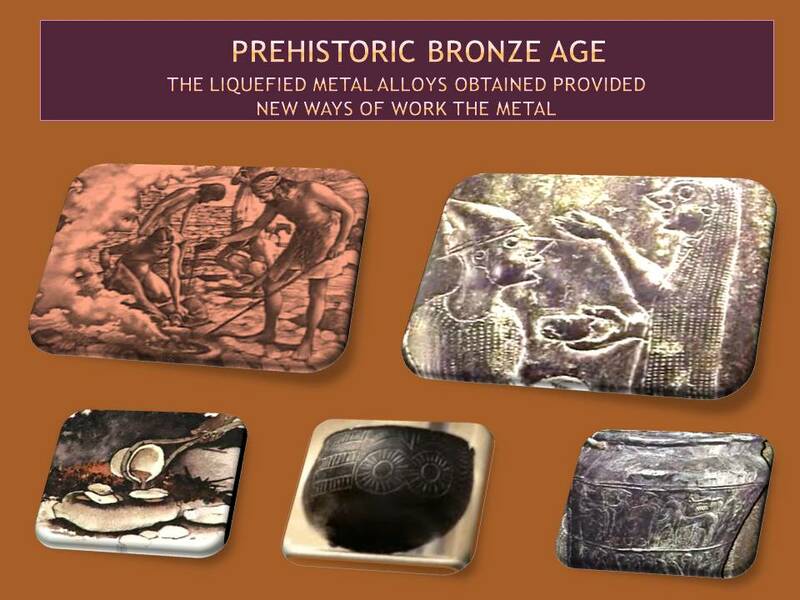 In the art of bronze period is to highlight the fact that in each region were produced some changes in their development of metal creations, because each region had a particular characteristic. This is an Historical period during which the iron replaced bronze as the material of manufacture of instruments and weapons. 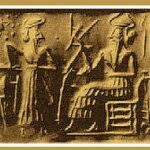 Iron seems to have been widely used for the first time by the Hittites in the Middle Orient region and spread from there to Europe, South Asia and North Africa. 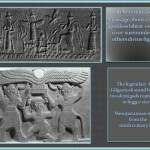 In Europe the first objects were obtained by hammering, is unknown if they only melt down them or added carbon too; aspects that was already known to the Hittites. 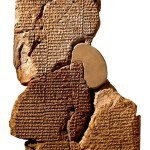 The Iron Age is the last period of prehistory prior to the beginning of the story with the invention of writing. The era of the iron was developed in the first Millennium before Christ in the Iberian Peninsula and is the final stage of the age of metals. The biggest advantage of the iron over the bronze lay in the fact that the ore to extract the mineral were much more abundant and therefore more economical compared to the bronze. It wasn’t necessary any alloy and constituted an admirable material manufacturing saws, axes and nails. It was, however, much more difficult to work and they never managed to get a temperature sufficiently high during prehistoric times to melt iron in mold, except in China. The material was simply heated in an oven; separating iron from slag; then reheated the iron turned on a single block, and, finally, working the metal through the use of the hammer to obtain the required shape. 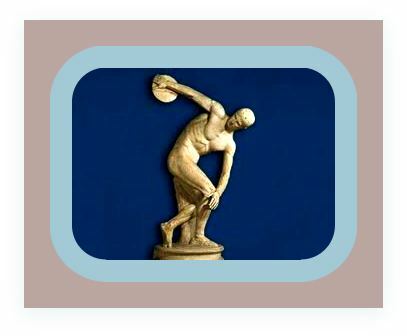 The process differed radically from the manufacture of copper or bronze objects, it is not surprising that the iron working was not a direct evolution of working the bronze which was used mainly to elaborate items of personal adornment, such as pins or mirrors. 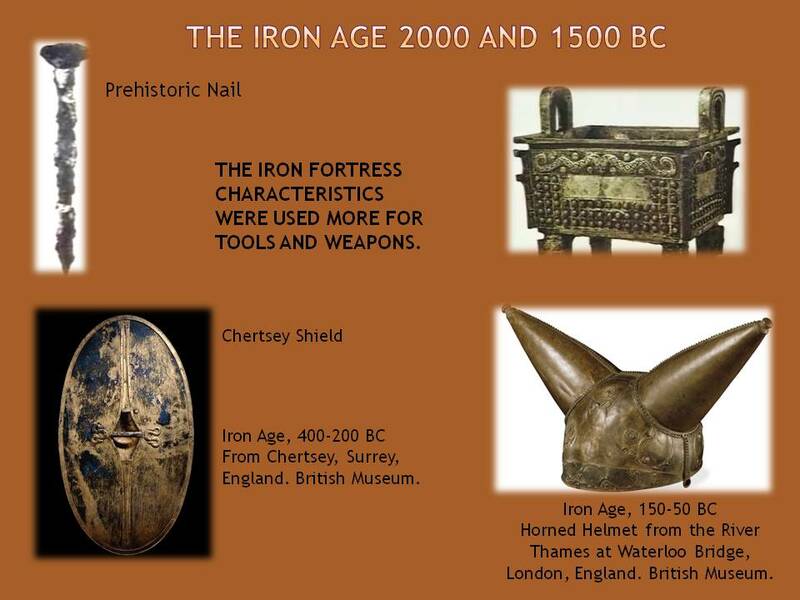 The iron strong characteristics were used more for tools and weapons. The gold and silver continued to be prestigious materials, employees to do, for example, the torques (heavy bracelets worn by warriors Celts). 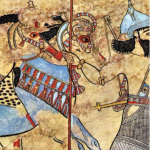 Military technology designed to take advantage of the use of iron was originated in Assyria; the trade of iron between Assyria and the independent city of Troy was already well established at that time, and the secret of its production was jealously guarded by the Assyrians. The Celtic peoples in Europe start using iron for tools and weapons and this aspect drive the development of the culture; since they prove to resolves more accurately daily life challenges, like manufacturing weapons and tools. This factor provides them with a better uses of their time which they don’t have to spend on tasks, obtaining better result in the quality of products as well, allowing the development for instance of the artistic part. 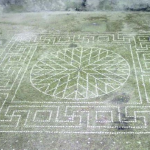 The use of metal provide a better result also in the rockwork, the Nordic petroglyphs are an example of the importance that the culture is gathering and these continue been developing in the next historical periods. Therefore the architecture used in the walls that protect the city already has watchtowers large necropolis and burial. In central Europe for example from the thirteenth century BC; began to spread the burial custom of the incineration, with the subsequent deposit of ashes in ceramic urns. 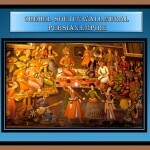 This custom had been generalized and used for many others culture along the history to this days. This entry was posted in Bronze Age Iron Age Prehistoric Art and tagged Bronze Copper Age Iron Ages Prehistoric metal production.